Whenever I play priest, my turn two play is hero power and emote. Arguably the best one drop for any Murloc deck. 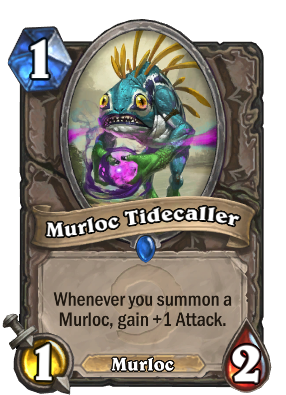 If played alongside Tinyfin and Tidehunter, you pretty much demand your opponent to board clear or directly target the Tidecaller for removal. Also, that golden animation is actually one of the best in the game by far. turn 1 murloc tidecaller turn 2 double grimscale oracle turn 3 murloc warleader turn 4 victory! the murlocs shall rule the world!!!! Murloc's Undertaker! Gets out of control in a blink of an eye!